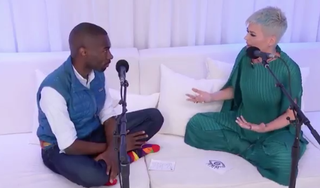 If you were going to pick someone to school Katy Perry on cultural appropriation, the first person to come to mind probably wouldn’t be activist DeRay Mckesson. But he’s the one with the branded podcast who thought it would be a good idea to get Perry’s side of the story regarding her cultural appropriation and problematic imagery. Wearing his ever-present blue vest, Mckesson welcomed Perry to Pod Save the People, and the two sat cross-legged on a white sofa to discuss Perry’s history with white privilege and appropriation. Perry admitted that she’s made several mistakes, for example, the hairstyles she’s chosen to wear, especially when it came to her “This Is How We Do” video. But apparently she has this “angel,” her black friend Cleo, to guide her when it comes to why she shouldn’t do half the stuff she does. Of course, some people on social media gave both Mckesson and Perry a plethora of side eyes, especially since it seemed as though Mckesson had put on his Superman cape to rescue the white damsel in distress. Maybe this interview would have gotten a better reception if it wasn’t airing around the same time that Perry is promoting a new album. But I’m pretty sure Perry isn’t going to stop appropriating or making bubblegum pop music anytime soon. The same way I’m sure Mckesson isn’t going to stop wearing his blue vest.